With summer peeking its head around the corner, I don’t know about you, but I’m thinking bathing suits, lazy days by the pool, summer vacations and how utterly light my skin is. I want that beautiful summer glow and I want it before summer. Is that too much to ask? I can tell you it’s not! When you’re armed with some good spray tan tips and products that work – beautiful glowing summer skin is right at your fingertips, er legs. I have experimented with quite a few products over the years, from lotions to sprays. I’ve always leaned toward the lotions (this one in particular that works quite well) because they were less messy and well, less scary to me. Last time I used a tanning spray, I ended up with streaks due to operator error. (Operator = Me) But, the color was gorgeous! What I realized was, I was going about it all wrong. From prepping for it to maintaining it, I missed the mark on that one. Here are some fantastic spray tan tips from those who seem to know what they’re talking about. 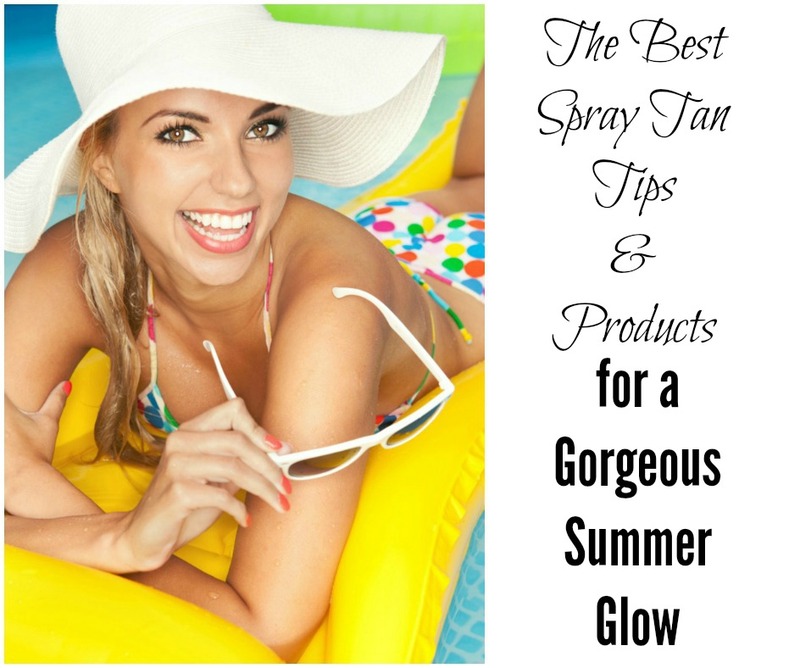 These ladies share three items they say are crucial to preparing yourself for spray tanning. Now they’re not talking about a spray tan you do at home, but rather the machine you stand in and it sprays you. But, these products would be great to use before you do it yourself as well. Two products they mentioned were Bobbi Brown Buffing Grains for Face and the Yerba Prima Tampico Skin Brush . ModaMob shares some tips and tricks for getting a great spray tan with at home products. She also talks about the importance of exfoliating and gives tips on using a tanner on your face. Did you mess up? Oops! No worries. She explains a simple trick to fix a tanning mistake. A couple of products featured in this video were Jergens Natural Glow and St. Tropez Exfoliator . BeautywithBeccaX3 shares entertaining tips on getting the best spray tan. She’s talking about the professional spray tan and mentions that you can go “nakey” or not. She also expresses the important of exfoliating and recommends using Caress Exfoliating Body Wash . I can’t get the work nakey out of my head now. Body Drench Quick Tan Instant Self Tanner Spray — Salon quality sunless tanning in a bottle. Quick Tan Instant Self Tanners give a natural looking year-round tan. Bronzing spray has 360 degree nozzle for easy application. Bronze tint for an instant sun-kissed glow. Tinted formulas make it easy to see where to apply. Natural-looking sunless tan develops in 3-5 hours. Neutrogena Micro-Mist Sunless Tanning Spray — Neutrogena MicroMist Tanning Sunless Spray applies like a professional airbrush spray for an all over worry-free, just back from the beach tan. Fake Bake Instant Self-Tanning Spray — Get an instantly bronzed look using Air Brush Instant Self-Tanning Spray by Fake Bake. Continuous-spray, 360-degree nozzle allows you to spray anywhere on your body¿even hard-to-reach areas. Quick-drying formula combines natural actives with two potent tanning ingredients for rich tones. Are you ready to try spray tanning, either at home or professionally? Have you done it before with great results? Let me know your spray tan tips and tricks! Previous articleYou’re Invited to the Omaha Steaks Twitter Party to Chat #StraightTalkonSteak, Plus a Giveaway!